I had concluded the first part of my trip to Sai Dhaam Shirdi with some of the experiences shared by one of my co-traveler about Baba that really filled me with thrill and pleasure. Hearing about fellow devotees’ experience of Baba’s grace gives so much pleasure & assurance to the hearing soul that someone is indeed there taking care of you!! With an assured and pleased heart, I rambled my way to my booked accommodation wondering about Baba’s assurance to HIS children. . . I had booked a room in dwarawati bhakta niwas which is run and maintained by Shri Sai Baba Sansthan Shirdi. Instead of toying around in hotels and lodges in and around Shirdi, I believe renting an accommodation in one of the facilities owned and run by Shri Sai Baba Sansthan Shirdi is the best option. Besides giving rooms at a descent rates, these also offer comfortable stay with beautiful surroundings and environ that adds charm to your overall trip. After settling in the room for some time, I rushed downstairs (my room was there on second floor) to watch Baba’s Dhoop Aarti on the TV that telecast live darshan from the Samadhi Mandir. Baba’s evening aarti (or dhoop aarti, as it is referred to) is done daily in Samadhi Mandir at sunset i.e. around 1840 Hours. At the ground floor of the bhakta niwas, there's a big television installed for the devotees desirous to have Baba's darshan. 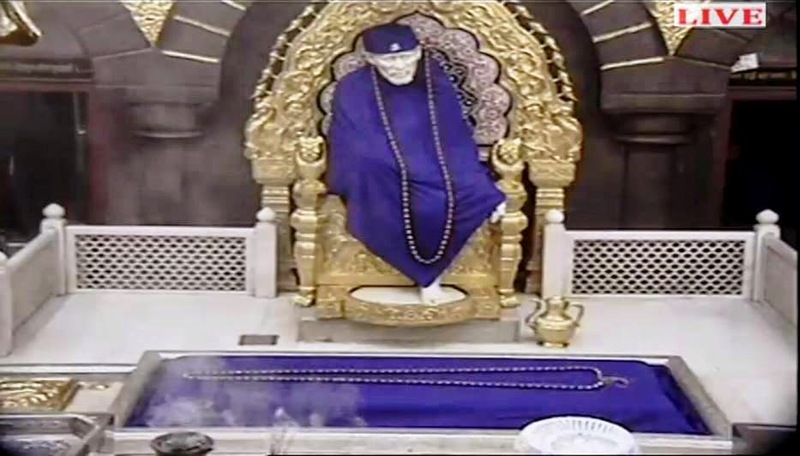 It captures Baba's live darshan from the temple and serves as a sitting point for many devotees desirous to see Baba’s live darshan from the temple; specially the old age people who finds it difficult to visit temple too often. They often make themselves seated on the seats before the TV and adore Baba's magical idol with silent prayers in their heart and smile on their face. Once the aarti got over, I rushed back into the room to get ready for Baba’s darshan in the temple. As always, before proceeding to Samadhi Mandir, I first paid a visit to Khandoba Temple which is on the way and then proceeded towards Baba’s holy shrine. Khandoba is the local deity of the village who is said to be a reincarnation of Lord Shiva & it is said that Baba got HIS name ‘Sai’ from here only when the priest of this temple (Mhalsapati, who also happened to be an ardent devotee of the Baba) welcomed a young nameless fakir as 'Aao Sai' (Welcome Sai!). This was during Baba's arrival after many years to Shirdi, after this incident the nameless fakir got the name 'Sai' and the small village called Shirdi got its 'Saviour'. After prostrating to Lord Khandoba & other deities, I proceeded towards darshan queue for Samadhi Mandir. It’s so heartening to see devotees all around the places standing together in the queue leaving aside their cast, creed, race and financial status; the whole darshan hall was filled with the slogans and chants about Baba. After about a little over an hour in the darshan queue, I entered the main temple, the whole environ was truly amazing with all the devotees chanting Baba’s name with faith and passion. Few minutes later, I found myself in front of Baba & was blessed with a blissful darshan, simply looking at HIS idol in the temple gives such an immense peace that everything else appears futile. Shej Aarti Experience. . .
Just after Baba’s darshan, I rushed my way towards Shej Aarti queue as the time of night aarti (known as ‘Shej Aarti’) was approaching. There’s something interesting about the night aarti of Baba, as this was the first aarti offered to Baba by his devotees. Baba never persuaded HIS worshiping by the people of Shirdi but gradually when HIS grace and energy touched with the chords of people beyond the small town, HE agreed to their demand of being worshiped Accordingly, the first aarti of Baba in Shirdi was performed in Shri Chaavdi (the place where Baba used to sleep every alternate day) on Dec 10 1910. While standing in the aarti queue & waiting for the line to proceed to Samadhi Mandir, there was one interesting thing that happened. . I was casually wondering about what Baba would be wearing during the Shej Aarti and suddenly the thought came to my mind that how great it would be if Baba’s wore blue attire, as HE simply looks great in blue. . .Lo and Behold, at that very instant I saw Baba beaming and smiling through one of the TVs installed in darshan queue in blue attire. There are no words to express the joy and thrill watching at that sight. Through-out our lives small-small things happen that makes us realize the magic of the life. . . some dismiss them as mere coincidences, while others cherish them as life's blessings (I, normally, find myself in the minority of the later). As luck would have it, I found a niche for me inside the sanctum, though it was just behind the pillar in a way that Baba’s idol was not perfectly visible therefrom. . I really felt elated from within. Then there was also a TV in front of mine which showed Baba’s composed stature just as close as it could be. All these things were a lot more than what I could have asked for. But guess there was something else that was planned for me that night, suddenly there was some movement of the devotees and from the pillar behind, I moved ahead just little far from the Baba’s idol. Just few moments later Baba’s aarti started and everyone found themselves immersed into the aura that emerged therein. This can be simplified as, many people died reading so many books in lives yet they couldn't attain the wisdom in life; only those who read & understand the language of love becomes wise with wisdom more than what could be attained with thousands of the books. Next in the agenda was Nandadeep (which is one of my favorite places in Sai Dhaam Shirdi), wherein there is a small temple type structure under a need tree which houses a perpetually burning lamp. This is known as ‘Nandadeep’ (the lamp of bliss) or Akhanda Deep - "perpetually burning lamp". Baba is HIMSELF said to have lit this lamp & later instructed Abdul Baba to see that its burning through-out. HE enjoyed spending time here meditating without preferring any interference. It is said that Baba liked to sit in contemplation & introspection and was often seeing talking loudly with HIS face pointing towards the sky as if having conversation with someone up above the sky. Sitting below this tree and taking circumambulation around the tree gives inexplicable peace to the soul. Thereafter, I decided to return to the room after spending some time in Baba’s dwarkamai. The best part of Baba’s dwarkamai is that it remains open through-out and therefore is above the shackles of strict routine frame. There is no time table or schedule according to which someone has to come or leave; its like Baba's lap wherein anyone can visit at any point of time - come, sit, relax, rejoice, feel blessed and go. Though, the inner portion of Baba’s abode is closed at 2130 Hours, the masjid (as Baba used to call this) remains open through-out for the devotees to rest and spend time in Baba’s lap. I’m reserving further details about these places for some other occasion when I will write about the places in Sai Dhaam Shirdi. The Wake-Up Call Apathy Syndrome. . . When I returned to the room, it was already midnight with both the hands of the watch embracing each other perhaps bidding good night to one and all. While I was so dead tired that would have comfortably preferred a nice sound sleep, there was something in me which was thinking otherwise as sleep would have meant early arrival of the next day (not literally of course !!) which was supposed to be my departure. Nevertheless, I chose to surrender to the night queen and retired to sleep with an early morning alarm set in my mobile to wake me up at 0300 Hours in the morning, so that I could enjoy early morning aarti / darshan of Baba. But (as expected) the morning alarm ditched me (or rather it was me who ditched it with a ‘not-giving-a-damn’ attitude towards the alarm). That wasn't the first time when the conflict between my sleep and morning alarm actually happened. Our association dates back to my school days when every morning I wished the morning alarm to be a live being so that I could punch it once or twice for not keeping up the date with me. Incidentally, I do wonder at times as to whether the un-susceptibility to the daily early morning disturbance of that thing called “alarm” is actually a boon or disorder or both. Well, whatever it is, that day it proved to be a disorder as that meant that I couldn't have morning darshan of Baba. And the moment I was up, I could sense the urgency in the air with a everything in the room scattered and a morning train to catch. Without missing a moment more, I packed my luggage and got ready hurriedly not miss the date I had with the train. Nevertheless, instead of cribbing about what I missed, I boarded the train cherishing with a humble heart what Baba had conferred upon me. . .something which was lot more than what I could have aspired and perhaps deserved !! Thanks Priyanka for your kind words...felt great indeed. Its all Baba's grace!! I'm sure HE will call u soon, just make a plan and rest HE will take care..